Doug McFalls over at the "Life On LeConte" Blog posted an excellent article about the 12 hikers who completed the 40th annual Dr. Charles Lindsley Memorial Hike this weekend. Dr. Lindsley suffered a fatal accident on the Alum Cave Bluff Trail on an Ashville School hiking trip in 1971. The posting includes a reprint of a letter from Lary Pless that tells the story of what happened that day. Please click here to read the article. As many of you know, Ed Wright succumbed to complications of congestive heart failure in his sleep on the evening of 11/24/09 at the age of 84. 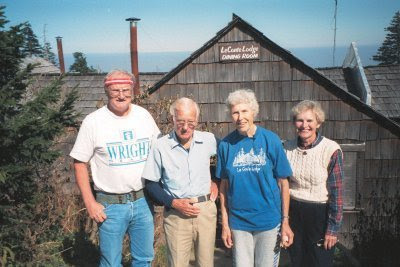 Mr. Wright was famous for having hiked to the summit of Mt. LeConte on 1,310 occasions. Many of those hikes are documented on his website. His family is planning a memorial hike up Alum Cave Bluff Trail on Sunday, September 5, 2010. Family members will be at the trailhead at 7:00 a.m., and anyone is welcome to join them. For more information on the Alum Cave Bluff Trail to the summit of Mt. LeConte, please click here. One other thing, his family felt it would be a fitting tribute to continue posting guest hikes on his website. Ed's daughter Peggy will respond to email and post hikes just as Ed had done in the past. As a result of the snow that began falling yesterday, almost every road in the Great Smoky Mountains is temporarily closed. As of 7:30 this morning, the National Weather Service is reporting 1 inch of snow at the Sugarland Visitor Center and in Cades Cove, 2" at Oconaluftee, and 8" at Newfound Gap and atop Mt. LeConte. Please click here for the most updated road information or you can call 865-436-1200. The forecast for Gatlinburg calls for more snow, freezing rain, and sleet before 4 p.m. today, then a chance of snow. High near 32. West wind around 5 mph. Chance of precipitation is 80%. Total daytime ice accumulation of 0.1 to 0.2 of an inch possible. Total daytime snow and sleet accumulation of 1 to 2 inches possible. I found this to be quite an interesting story. The Colorado Mountain Journal website is reporting that someone has activated their personal locator beacon on 9 separate occasions between December 14 and January 5 of this year. The problem is that the owner never registered the device, so authorities haven't been able to contact him or her. After the fourth or fifth activation from the same device, local authorities decided not to alert Search and Rescue (SAR) teams anymore. Instead, authorities focused on trying to determine who owned the PLB, and on getting the word out to the public that there was a problem. Specualtion is that the still-unknown person who owns the device has apparently gotten the message on how to use it - and how not to. The key take-home message for PLB users is that they need to learn how to use these devices to prevent false alarms, and they need to register them so that a simple phone call might prevent inadvertent SAR-team call-outs. Great Smoky Mountains National Park managers and officials from the Tennessee Department of Transportation (TDOT) met Tuesday to develop plans to improve the traffic flow and safety of the mile-long detour that carries southbound US 441 traffic around Monday night’s rockslide. Currently the south-bound traffic is being diverted onto one of the two lanes that normally carry north-bound traffic, creating two-way traffic flow. The slide occurred on the portion of the Gatlinburg-Pigeon Forge Spur which is owned by the State of Tennessee, so TDOT has sole responsibility for repairs of the slide itself. The rest of the 5 mile-long Spur, including the detour area, is part of Great Smoky Mountains National Park, so the two agencies are working jointly to manage traffic during the closure of the south-bound Spur which TDOT believes may last a month or more. Smoky Mountain Rental Cabins Cabin and chalet listings in the Smokies. Since 1934, Mount Washington in New Hampshire has held the record for the fastest wind gust ever recorded on the surface of the Earth. In a report released last Friday by the World Meteorological Organization (WMO), that record was toppled on April 10, 1996 at an unmanned station in Barrow Island, Australia during Typhoon Olivia. According to the report, the new record now stands at 253 mph. Cara Rudio, Marketing and Communications Coordinator for the Observatory has been fielding many questions from the media, mainly as to why it took 14 years to figure this out. The quick answer according to Rudio is that it didn't: the record has been there all along. It was recorded by the Barrow Island station when it occurred, but not publicized until the WMO evaluation panel stumbled upon it while conducting a review of world records. 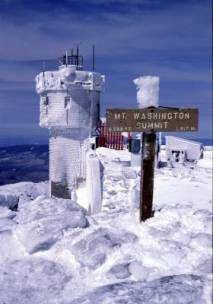 Mount Washington’s famous wind gust of 231 mph, recorded on April 12, 1934 at the Mount Washington Observatory, still stands as the record for the fastest surface wind measured in the Northern and Western Hemispheres. Mount Washington Observatory, which operates within the 59-acre Mt. Washington State Park, is a private, non-profit, membership-supported organization. Since 1932, the Observatory has been monitoring the elements in one of the most extreme locations on Earth, using this unique site for scientific research and educational outreach. Below is a short video from the Great Smoky Mountains Association highlighting the Nordic Ski Patrol in the Smokies. Most people probably don't know it, but Great Smoky Mountains National Park has its own all volunteer Nordic Ski Patrol, certified through the National Ski Patrol. The patrollers are well versed in First Aid and other cold weather emergency medical services, and are able to assist in search and rescue operations. This year there are 8 volunteer patrollers, mostly working on weekends on Clingmans Dome Road and in the Newfound Gap area. They provide information to park visitors while monitoring winter conditions and visitor use on Clingmans Dome Road. On a typical patrol day, they ski to Collins Gap, about half way to Clingmans Dome and report on snow conditions to park dispatch via park radio. In my email today I received the latest addition of "The Cub Report", the monthly e-newsletter from the Great Smoky Mountains Association. The report includes some brief statistics on nuisance bears in the Smokies. The GSMA reports that wildlife managers captured 21 bears (9 males, 8 females, and 4 unknowns) during 2009. Two bears were caught twice. Bears are considered to be nuisance bears when they associate people with food, which means they have the potential to become dangerous. Usually, wildlife managers examine and process the bears and then release them at or near the site of capture. Seven of the bears were released on-site, and 16 bears were moved to other parts of the park, far from the picnic areas, campgrounds, and parking lots they had come to know as their own personal cafés. Bear populations have grown to record numbers across the Southern Appalachians. Wildlife biologists from the Southern Appalachian Bear Study Group agree that 2009's black bear population throughout the region appears to be the highest on record. Bait station surveys in Great Smoky Mountains National Park reported more sightings of bears in 2009 than at any time since record keeping began in 1981. There are now estimates of nearly two thousand bears living within the park. Blue Ridge Outdoors Magazine recently named the winner of their Person of the Year award. This year's winner is Warren Doyle who will be attempting his 16th thru hike of the Appalachian Trail in 2010. He's nearly 60 years old! He also currently holds the record as the person who has hiked the AT the most times. The magazine did a nice article on Doyle. It was written by Jennifer Davis who currently holds the women’s Appalachian Trail speed record after completing the 2176-mile trek in just 58 days in 2008. Below is a trailer for the 2009/2010 Banff Mountain Film Festival. Let me tell you, there is some outstanding and incredibly beautiful footage in this short film. Make sure to watch the last scene. I posted this same footage on this blog about a year ago. I thought that maybe it was manipulated, but now appears to be the real deal. You can click here to see the full tour schedule. There are several stops in the Southern Appalachian region over the next couple months. This is a follow-up to a blog posting I did earlier in the week with regards to Yellowstone National Park recently adopting a comprehensive plan that could open the door to the use of web cams in the backcountry. This raises a number of troubling questions. The plan would not allow public access to view what the cameras are seeing. How can that be legal? They would be paid for with public dollars, put on public lands that are also funded by public dollars, and administered by public employees. That's like saying video from revenue-light cameras is not public. Naturally, we thought we'd check with the Great Smoky Mountains National Park to see if it were considering the move. Morgan Simmons, our master reporter on all things Smokies and outdoors, checked and filed this e-mail: I checked with the Smokies regarding the Yellowstone National Park's proposal to upgrade webcams in developed areas and possibly install them in the backcountry. The Smokies is not considering anything like that (and were unaware of the story). The park currently has two webcams, one at Look Rock, other at Purchase Knob. Both monitor air quality/visibility. It doesn't surprise me that there aren't any plans to install backcountry webcams in the Smokies, however, I was a little surprised that the park didn't know anything about the Yellowstone plan. Of course this doesn't mean that the concept doesn't catch on at some point. That's the question being asked over at the Blue Ridge Outdoors Magazine website. Since dogs are prohibited from most trails in national parks, the question actually pertains to trails in national forest areas. Right now, by a 6 point margin, voters in this poll are indicating that they think dogs should be allowed to run off-leash while hiking. I guess it all depends on the dog. If he follows commands well and is not aggressive to other dogs / hikers, sure take him off the leash. However, there is always the person that thinks their dog is special, and should be able to do as they please. These are the ones that always cause trouble for the others. Just remember, not everyone in the woods loves “Fido” the way you do. Be respectful. Many of you think that dogs are fine to be let off a leash if they are well behaved. The problem is that everyone thinks their dog is well behaved when in many cases they are not. So if the rule is your dog can be off a leash if it is well behaved then how is it enforced? Who decides if your dog is well behaved? So what do you think? If you would like to vote and leave a comment, please click here. A grant from the Eastman Chemical Company Foundation is allowing the Appalachian Trail Conservancy (ATC) to underwrite discounts on the fees for the next 500 people to apply for an Appalachian Trail license plate in Tennessee. Once 1,000 applications are received and the state begins producing tags, ATC’s share of the renewal fees will serve as a permanent funding source for the organization's work to protect and maintain the 280 miles of the Appalachian Trail in the state of Tennessee. As a result of the grant, the Appalachian Trail (A.T.) license plates are now available for $15 instead of the usual $35 annual fee. Renewals will be at the standard $35 annual fee. The ATC is offering its own incentive as well, thanking people who sign up for the license plate with a one-time annual membership to the national non profit. Existing ATC members may give someone else the membership as a gift. The specialty A.T. license-plate program will benefit the state’s natural resources and national treasure in several ways. It will broaden awareness for this resource by widely promoting the Trail on vehicles from Memphis to Bristol. In addition, each plate will generate $15.56 annually for ATC, supporting management of such programs as land conservation, volunteer-based trail and facilities maintenance, natural-resources management, and programs that introduce children and teachers to the A. T. in Tennessee. For more information and an application to take advantage of this offer, call the ATC at 828-254-3708 or go on line to www.appalachiantrail.org/tnlicenseplate. The N.C. Wildlife Resources Commission will take public comment on 66 proposed changes to hunting, fishing and trapping regulations, including a new rule that could result in elk losing their status as a species of special concern. After hearing public comments and reviewing written comments, the Wildlife Commission will meet in March and vote whether or not to adopt the proposed rules. You can view all the proposed changes and the public hearing process by clicking on this PDF file. The public can comment online or submit comments by mail to 1701 Mail Service Center, Raleigh, N.C. 27699-1701. Tomorrow is the deadline for all submission of comments. Is Big Brother headed to the backcountry? Kurt Repanshek at the National Parks Traveler has an excellent article over at his site concerning the prying eyes of big brother. It seems that Yellowstone National Park has recently adopted a comprehensive plan regarding the use of technology in the park that could open the door to the use of web cams in the backcountry. It should be noted that the National Park Service has not approved the use of cameras as of yet. Existing webcams within developed areas could be upgraded to wireless, or new wireless webcams could be installed in developed areas of the park if they are found to meet the siting criteria adopted by this FONSI. No wireless webcams for visitor use will be installed within backcountry areas of the park. It is possible that wireless monitoring cameras could be placed in backcountry areas for resource monitoring or to address safety concerns, but these will not be available for public viewing purposes. Mr. Repanshek brings up several provocative questions and issues regarding the plan. You can read his full commentary, and find a link to the Yellowstone Wireless Communications Services Plan by clicking here. How likely is this to become a reality across the national park system? But this discussion is inevitable, especially with the coming Feb. 22 introduction of a new law to allow loaded firearms in national parks. First, the moment one of those rangers or a backpacker or a horse rider becomes a victim of a crime committed by someone wielding a gun, and that crime either could have or was captured by a camera, I predict there will be an outcry for greater safety measures. This is the stuff of which lawsuits are made. If the National Park Service has the capabilities of implementing safety measures to deter such crime or in the event of such crime can be used as evidence for the purpose of justice, then you can bet lawyers will get involved. Both Kurt and Dave agree that this is potentially a slippery slope, which would ultimately be bad for backcountry users. I totally agree with them and will state further that government (big brother) cannot and will never be able to protect us from anything or everything that could possibly go wrong, whether it be in the wilderness or on a city street. Where does it end? Are we going to allow governments to put cameras in our homes? After all, how would authorities know if there isn't child or spousal abuse going on within your home? National Geographic News is reporting that Bisphenol-A, or BPA - a common, human-made chemical that enters most of our bodies everyday - has been linked to heart disease according to a new study. The study comes as the U.S. Food and Drug Administration - which has until now maintained that BPA is safe at low levels - announced this past Friday that the FDA has some concerns about the impacts of BPA on developing fetuses, infants, and children. The agency is also urging consumers to reduce their exposure to the chemical until further studies are completed. BPA is commonly used in consumer plastics, particularly polycarbonate plastic items such as many sunglasses, reusable bottles, food packaging, and baby bottles. It also lines the inside of food cans. It's probably a good idea that you check all of the water bottles/containers that you use for hiking, cycling and gym exercise just to be safe. You can look at the recycling code on the bottle (usually on the bottom) to determine if it contains BPA. #7 is the type that may contain BPA (and the code may look like the image on the right). Most store-bought water bottles are not #7. It's typically the hard polycarbonate plastics that contain this type of plastic. There's no denying that many medical and scientific studies have proven to be false over the years. However, with something like this, it's just too easy to be safe rather than sorry. I just threw out the one bottle with a #7 we had in the house. As a result of the late December snow storm, Old NC-284 between Big Creek and Cataloochee will probably be closed until mid-February due to downed trees. In the latest addition of the Carolina Mountain Club E-newsletter, the hiking club announced it's position on building and maintaining the Mountains-to-Sea Trail through the Great Smoky Mountain National Park. CMC remains committed to building and maintaining the Mountains-to-Sea Trail (MST) from Heintooga Ridge Road at Wolf Laurel Gap (MP 458.2 on the Blue Ridge Parkway) to Black Mountain Campground east of Mount Mitchell. The MST is complete in the Great Smoky Mountains National Park from Clingmans Dome to Mingus Mill. Three routes are under discussion for connecting the two pieces of the MST. 1) Across the Qualla Boundary to the Oconaluftee River Trail to Mingus Mill. 2) On Blue Ridge Parkway land to the Oconaluftee River Trail to Mingus Mill. 3) From the current MST on Newton Bald Trail, along a series of existing trails in GSMNP to Polls Gap and on Heintooga Ridge Road. CMC supports Option 3, using existing trails in GSMNP to complete the MST, as it offers the quickest and easiest way to complete the MST in our area. CMC will not commit to further trail building on the MST, should either Option 1 or Option 2 be chosen. The proposed route drops down to the Smokemont Campground from the Newton Bald Trail. From the campground, the trail follows the Bradley Fork Trail, Chasteen Creek, Hughes Ridge, Enloe Creek, Hyatt Ridge, Beech Gap, Balsam Mountain, Mt. Sterling Ridge, Pretty Hollow, down the Cataloochee Road to the Rough Fork Trail and on to Polls Gap. When fully completed, the Mountains-to-Sea Trail will stretch roughly 1000 miles from Clingmans Dome in the Smokies to Jockey’s Ridge on the NC Outer Banks. You may recall from a posting a few weeks ago that the JP Morgan Chase Foundation was sponsoring a Facebook-based charity campaign in which voters directed where Chase grants would be awarded. The Appalachian Trail Conservancy (ATC) was among 100 organizations to win a $25,000 grant during the first round of the Chase Community Giving campaign. Those same 100 organizations are now automatically eligible for a chance to win a final $1-million grant in the next round of voting, which begins today. In this next round, the ATC and the other winning organizations have submitted documents stating what difference $1 million would make in their work. One organization will win that amount, and five others will receive $100,000 each. A Chase advisory board will select other charities to share in another $1-million pool. The program the ATC is seeking funds is for is called Mother's Nature Keepers. 2) You have to be a fan of Chase Community Giving- click here and then click on the "Become a Fan" button at the top of the page. 3) To vote for the ATC click here - then click on VOTE once on the Appalachian Trail Conservancy "Big Idea" page. You will likely be prompted to allow Chase to access your information so they can keep track of the votes. Please "Allow" or your vote will not be tabulated. Each voter gets 5 votes they can spread around, however, the ATC hopes that supporters will only vote for the Appalachian Trail Conservancy. Voting ends on January 22! You can also find additional information on the ATC website. 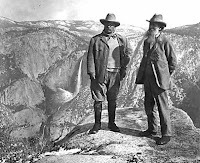 The National Park Service announced this morning that the Ken Burns’ series, “The National Parks: America’s Best Idea,” will return for an encore broadcast on PBS this month, with the first episode airing on January 27th. It will then appear on consecutive Wednesdays through March 3rd. The series, which premiered this past September, was the second most-watched series on PBS over the last decade. It reached a total audience of 33.4 million viewers. The most-watched series was “The War,” also produced by Burns, which attracted a total audience of 37.8 million viewers. “The National Parks” had a huge online presence as well. Its web site was the most visited program page on PBS.org during the week of broadcast and had 544,000 unique visitors between September 1st and October 31st, with 2.5 million page views in the same period. The program’s Facebook fan page boasted more than 50,000 fans by the time of the broadcast. There were more than 185,000 streams of the episodes during the two weeks they were available, making it the most-watched program on the PBS Video Portal during the week of broadcast, with viewers watching on average at least 55 minutes of the full episodes online. In comparison, the average online viewer watches only six minutes per video of content on Hulu. Since its release on October 6, the series’ DVD set has been a best-seller at many national retailers. “The National Parks” also launched PBS’ first general-audience iPhone application, which highlighted the series, behind-the-scenes information and more. The companion book, written by Dayton Duncan, introduced by Ken Burns and published by Alfred A. Knopf, Burns’ longtime publisher, spent seven weeks on The New York Times best-seller list. 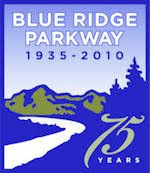 To help celebrate the Blue Ridge Parkway's 75th Anniversary, the state of Virginia is launching the "Go Green on the Blue Ridge Parkway" sweepstakes. People can enter to win a seven-day, six-night vacation for four. Complete with airfare, a hybrid car rental and over night stays at the Wintergreen Resort, the Hotel Roanoke, Stonewall Jackson Hotel and Shadow Mountain Escape. The prize list includes a variety of entertainment options along the way as well. The “Go Green” Sweepstakes runs through November 1. Anyone 21 and older can apply. For complete details and contest rules please click here. The votes are in! Blue Ridge Outdoors Magazine has recently published the 2010 Best of the Outdoors in the January issue of its online magazine. The article highlights the results of their readers choice awards in which readers pick their favorites of the Blue Ridge region. Exh year, readers have the opportunity to vote on their favorites among a variety of outdoor activities in the Blue Ridge, including their favorite trails, waterfalls, running and cycling events, skiing, adventure racing, climbing and paddling locations, among several other categories. The Great Smoky Mountains made it into the voting in only two categories. * The Smokies were rated as the 4th best section of the Appalachian Trail. The Dragon's Tooth in Virginia ranked first, with Mt. Rogers and Roan Mountain finishing second and third, respectively. * Mt. LeConte was voted as having the sixth best mountain summit in the Blue Ridge region. Roan Mountain was number one. Rounding out two through five were Old Rag, Max Patch, Mt. Mitchell and Cheoah Bald. You can check-out all of the winners of every category by clicking here. Hey, if you don't like some of these results, make sure you vote next year! I wanted to let everyone know that I've added 5 more trails to the HikingintheSmokys.com website. Of course HikingintheSmokys.com has many other trails listed on the site that provide similar information as the trails above. You can find details on many of the popular hikes in the Smokies such as Mt. LeConte, Gregory Bald, Rocky Top, Charlies Bunion, Abrams Falls, etc. Please click here to visit the entire site. If you get a chance, check out the awesome photos at the top of Mt. LeConte by Doug McFalls, the winter caretaker of the lodge. He's posted several beautiful winter scenes over at his blog, Life on LeConte. 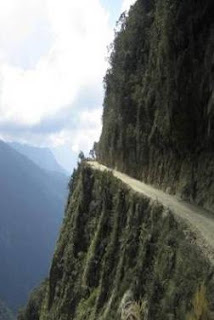 Check out the video below of Bolivia's "Death Road". This is from a segment of ABC's Nightline that shows off the thrills of biking down Bolivia's "World's Most Dangerous Road", one of the most popular adventure travel activities in all of Latin America. The Yungas Road, also known as "Death Road" and the "World's Most Dangerous Road", earned these nicknames because it has more deaths per mile than any other road in the world. The bike ride starts out at roughly 16,000 feet elevation and descends to 4,000 feet in roughly 40 miles. The bike ride takes nearly 7 hours, as the road snakes its way through the high mountains of the Andes to the subtropical jungles that lead to the Amazon basin in Corocio, Bolivia. Think you want to do this? The Benton MacKaye Trail Association is launching a monthly hiking series this year to introduce people to the new long-distance trail that crosses through the remote southern Smokies. The Benton MacKaye Trail is a long-distance footpath of nearly 300 miles that takes hikers through the Southern Appalachian Mountains. From Deals Gap to Davenport Gap, the trail runs for 96 miles through the Great Smoky Mountains. 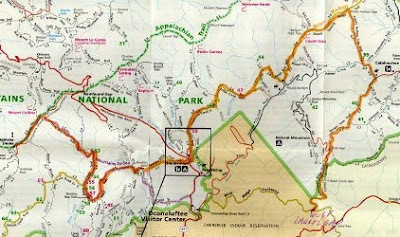 The red line represents the Benton MacKaye Trail and the yellow line represents the Appalachian Trail. The trail was designed in the tradition of the Appalachian Trail, which was the brainchild of Benton MacKaye, a forester and co-founder of The Wilderness Society. It follows MacKaye’s original vision for the AT, which consists of a more westerly route as it proceeds out of Springer Mountain in Georgia. The BMTA will feature a different section of the trail on a day-hiking series held the third Saturday of each month in 2010. The first hike of the year will be held Saturday, January 16, which will follow Big Lost Creek Trail. The hike, about a six-mile roundtrip, features a beautiful gorge, high rock walls, cascading rapids and falls. The website emphasizes that you don't have to be a BMTA member to hike with the group. Please call the hike leader Liz Carter for the meeting time and place. 828.644.0645. You can also visit the BMTA website for more information. As of this morning, Newfound Gap has a total of 12 inches of snow on the ground, while Mt. LeConte has 15 inches. Click here for the most updated road information or call 865-436-1200. The forecast for Gatlinburg calls for scattered snow showers today with a high near 21. Chance of precipitation is 50%. Scattered snow showers are expected through tomorrow night. The Smokemont Loop and West Prong Trails are a couple of excellent choices if you're looking to get off the beaten path. Although you won't find complete solitude on either of these trails, you definitely won't find the crowds you normally find on many of the other trails in the park. The Smokemont Loop is just north of the Oconaluftee Visitor Center, and the West Prong Trail is located near the Great Smoky Mountains Institute at Tremont (near Townsend). Final Shot: As we were leaving, we just happened to notice this Great Blue Heron sitting on a rock in the middle of the Little River near the park boundary at Townsend. Interestingly, the Discover Life in America website states that "The Great Blue Heron is an uncommon year-round resident bird species in the Park". For more in-depth information on hiking the Smokemont Loop, please click here. For more information on the West Prong Trail, please click here. This Saturday, Jan 9, 2010, is your opportunity to head over to the Sugar Mountain Resort to try snowshoeing for free during National Winter Trails Day. The 15th annual National Winter Trails Day event at Sugar Mountain Resort is offering children and adults new to snow sports the chance to try snowshoeing for free. Snowshoe rental and guided tours are free. Guided tours are available on a first come first serve basis at 9am, 11am, 1pm and 3pm. The program includes a 1 hour tour and snowshoe rental. Adult tours are for 12 years or older. Children's tours are for 8-11 year olds. Participants must sign up at least 15 minutes prior to your tour time at the Ski/Snowboard School. Sugar Mountain Resort is located just south of Banner Elk, North Carolina. The Lonesome Pine Overlook is located on the Noland Divide Trail, roughly 3.3 miles from the trailhead in the Deep Creek area of the Great Smoky Mountains. This is an outstanding hike if you're seeking a little bit of solitude and some incredible views of the Southern Smokies. The overlook also offers commanding views of the Nantahala Mountains and Bryson City as well. The trail climbs more than 2300 feet to reach the overlook. Of course we had to have a little drama along the way as a result of a couple of large downed trees that were blocking the trail. The first one (pictured below), although it looks pretty bad, didn't give us too much of a problem. However, the second one, about 3/4 of a mile from the top was much worse. As we approached the downed tree it looked pretty bad. We decided our best bet was to go around the tree, which required a fairly difficult climb of about 50 feet up the steep hill side. The steepness and the dead leaves made it quite difficult to get traction. In the process Kathy ripped her fleece jacket, which she was none too pleased about. On our return, with a different vantage point, we discovered that there actually was a passable path through the downed tree. So, basically, Kathy ripped her jacket for no reason. For more in-depth information on hiking to the Lonesome Pine Overlook, please click here. During our visit to the Great Smoky Mountains last week, one of our destinations was the Kephart Prong Trail on the North Carolina side of the Smokies. I knew beforehand that there was a Depression era Civilian Conservation Corp (CCC) camp located near the trailhead. However, after hiking the trail, I was left with a lot of questions regarding some of historical artifacts that still remain in and around the trail. I've been able to answer a few of my questions with a little research on the internet, but was hoping that any historians or experts that might be reading this blog could shed some light on a few other questions. The first significant artifact that hikers encounter on the trail is this chimney. We originally assumed this was the remains from an old homestead, but have since found out that it was from the barracks at the CCC camp located here. In this same area we also came across the object below. I assume this is the framing for the camp signboard I've seen described in a couple of internet articles. However, there appeared to be a small water pipe at the top of the arch (can't see it in the photo). Did the signboard include some type of water display or fountain? Speaking of water pipes, if you do a little exploring off the trail you'll come across several large pipes scattered in the weeds in this same area. I've since learned that the Works Project Administration built a fish hatchery near this location in the 1930s to replenish trout and bass in the mountain streams. Were the pipes used as part of this operation? Did the WPA use the pipes to divert water from nearby Kephart Prong to the hatchery? Further up the trail we came across this large cement block sitting just above the trail. Anyone know what this was used for? I've read in a couple of places that this may have been a cistern. However, I'm not sure that necessarily makes sense, as workers would have used the nearby stream as a source of water. Unless of course the Kephart Prong was contaminated due to all the logging. For more in-depth information on hiking the Kephart Prong Trail, please click here. The forecast for Gatlinburg for the remainder of the day is for partly sunny skies and cold, with a couple of flurries. High near 31. In the Smokies, 2-5 inches of total snow accumulations are expected this morning - mainly in the higher elevations. More snow is expected later this week, as well as extremely cold temperatures. For the latest weather updates and forecasts for the Smokies, please click here. Timber Tops Luxury Log Cabins is offering 3 Nights for the Price of 2 during the month of January (Excludes Holiday Rate Seasons). Curry Mountain is a relatively little known or little used trail near Metcalf Bottoms on Little River Road. If you're seeking solitude in the heart of the Smokies, this is an excellent choice. If you plan on hiking this trail in the next few weeks or months, you should expect to see a lot of downed trees and downed rhododendron on the trail. Based on the fact that most of the fallen rhododendron still had green leaves on them, I would say it's likely they fell during the recent snowstorm. For more in-depth information on hiking the Curry Mountain Trail, please click here. Freezing fog occurs when liquid fog droplets (supercooled) freeze to surfaces, forming white soft or hard rime. These supercooled water droplets remain in a liquid state until they come into contact with a surface upon which they can freeze. As a result, any object the freezing fog comes into contact with will become coated with ice. That is the official definition, and is what we saw on Newfound Gap this past week as we made our way over to the North Carolina side of the Smokies. I've included a few photos of this beautiful weather phenomena below. On the morning I took these shots (December 28th) it was bitterly cold at the top of the gap. So I was quite surprised about how relatively little snow was still left from the December 18th storm that dropped 24 inches of snow on Newfound Gap. Before driving up there I was a little concerned that there would still be some slick spots near the top, but the road was virtually dry and free of ice and snow. We spent five days in the Smokies on this latest trip. Over the next few day I'll be sharing photos from the trails we hiked. The Great Smoky Mountains Association will be holding an Owl Prowl on January 23. Join former park ranger Butch McDade on Saturday, January 23, for a nighttime adventure into the elusive world of owls. Participants will meet at the Sugarlands Visitor Center at 7:00 pm. The GSMA is asking participants to bundle up with winter clothing, wear hiking boots or athletic shoes with tread, and bring flashlights or headlights... maybe even a rain parka, just in case. Please register in advance by calling 865-436-7318, extension 222 or 254. There's a small $5.00 fee to help cover the presenter's fee.